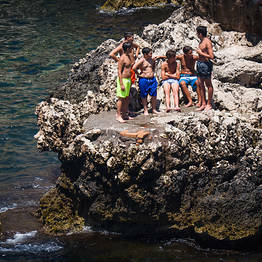 Capri is not a particularly "kid friendly" destination: there are no beaches with sand, the roads are all quite steep or have stairs, and many hotels accept adult guests only. That said, even children can enjoy a visit to Capri, especially if you can find a safe place for them to play and blow off some vacation steam. Here are some of my tips, now that I have first-hand experience as an "island mother". If you are travelling with a baby or toddler, pay careful attention to where your hotel is located with respect to the center of town. Many hotels are located just steps from Capri town's central Piazzetta or Anacapri's historic center, but those steps are actually a steep climb up, so hard to navigate with a small child or stroller. Anacapri is more "family friendly" than Capri town: there is a large public park with playground equipment where all the local children gather to play. The downside is that you will be quite far from the beach (the shoreline near Anacapri is all rocky cliff). On the other hand, if you prefer to book a hotel near the beach, keep in mind that you will be far from a town center. Near Marina Piccola, in particular, there are no shops where you can purchase baby supplies and no road where you can take a walk. Marina Grande is a better choice on the coast, as there are a number of shops, small supermarkets, and a quiet road for stolling along the port. Not all hotels accept children, so make sure you specify your children's ages when you book! Children under 3 years of age ride free on all the ferry routes and there are discounted rates for children under 12 (see the chart below). Strollers and pushchairs are allowed on all high speed ferries; on ferries and slow ferries, stroller and pushchairs must be left on the lower level with luggage. Children under 3 ride free; from 3 to 12 years old there are discounted tickets available that vary according to each individual ferry company. 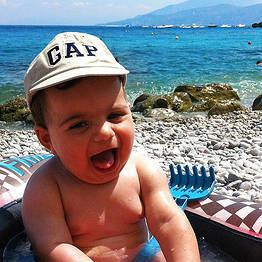 The town centers of Anacapri and Capri are both pedestrian only, so children can run around without danger of vehicles. It is also pleasant to take a walk with a stroller or pushchair, as there are not many steps. Getting around with the bus or funicular can be complicated, as both are often quite crowded and strollers and pushchairs must be folded to carry on board. On the chairlift to the top of Mount Solaro, children under 8 years of age ride free if they ride on their parent's lap. The chairlift is made of single seats with a lap bar. If you are travelling with an infant, you can ride with the baby in a front pack or tied to you with a wrap or scarf; for older babies or active toddlers, I do not recommend the chair lift. Capri: there is a small park near the Flora Caprense Gardens on a side street of Via Vittorio Emanuele (near the La Palma Hotel). Anacapri: the playground in on Via Giuseppe Orlandi, Anacapri's pedestrian street. In summertime, the beach becomes the de facto playground, while older children gather in the evenings in the town center for a pick up game of football or a walk around town. To be honest, there are no truly child-friendly beaches on Capri...there are only beaches which are a little more suitable than others. 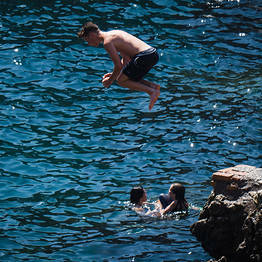 Most of the coastline with beach clubs is rocky, and bathers dive directly from the cliffs into the deep sea water. There are a number of beach clubs which actively discourage young children. 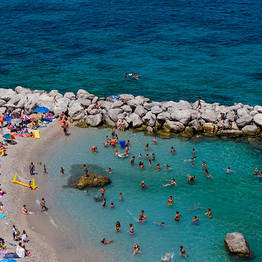 This is Capri's largest beach, where most of the island's children learn to swim. It is a pebble beach, and most of it is free and public. The area which is most suitable for young children is the so-called "della Scogliera" (at the far end of the beach opposite the high speed ferry ticket office). this stretch is shielded from the wind, has calmer water, and during the high tide there are a number of small tidal pools where little ones can play. Bagni Le Ondine: here swim lessons are often offered in the summer, along with other kid-friendly activities. A bit past Marina Grande, the Bagni di Tiberio beach can be reached on foot by going down from Palazzo a Mare or by boat with one of the shuttle boats which leave from near the high speed ferry ticket window. There is a free public area and a private beach club; the boat shuttle to either costs EUR 9. The private Bagni di Tiberio beach club is one of the most popular among the local families and those vacationing on Capri. There is a small beach with a shallow strech where kids can play under the Roman ruins. The Marina Piccola beach is popular for its clear water and view of the Faraglioni, but unfortunately is it always quite crowded. I suggest you head there early in the day to avoid the crowds. There are two free public areas, on the end near the Scoglio delle Sirene. Most restaurants on Capri are happy to serve children, though you won't find play areas or changing tables in the restroom. All have highchairs available, and though there are no kids' menus, options like pizza, pasta with tomato sauce, breaded chicken or beef, and french fries and gelato will always be a hit. Even if you don't find these dishes on the menu, most restaurants are happy to prepare them for young patrons...just ask your server! Kids all love the gelato at Buonocore...just follow the scent of freshly-made waffle cones along Via Vittorio Emanuele. Kids love to set sail! The boat tour companies which offer sails around the island of Capri (Motoscafisti and Laser Capri) let kids under 5 years of age sail for free. 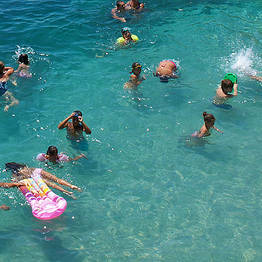 Kids under 6 enter the Blue Grotto for free; from 7 to 17 years of age, the discounted ticket is EUR 9 (rather than EUR 13). If you choose a private boat tour, don't forget to let your skipper know that there are children in your party before you set sail, so they can make sure to have suitable safety equipment on board.